October 29, 2010  The Jon Stewart/Stephen Colbert rally allows them to visit the source of much of their material. It's also one of the rare times when the germ idea that led a large group to come to DC was a joke instead of a serious cause. 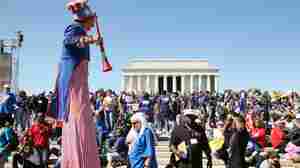 October 3, 2010  The crowd at conservative broadcaster Beck's gathering in August spread over more of the area between the Lincoln Memorial and Washington Monument than that at Saturday's gathering of liberal groups, AP reports. 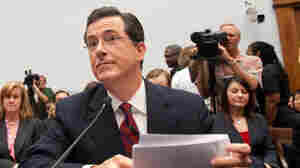 September 24, 2010  Comedian Stephen Colbert gave a truthiness jolt to a congressional hearing on illegal ag workers. September 24, 2010  The Comedy Central mock conservative TV host will testify before congress, in character, today. He's appearing with the head of the Farm Worker's Union to highlight the plight of immigrant workers. September 17, 2010  Comedians Jon Stewart and Stephen Colbert plan DC rallies for late October to spoof and counter Glenn Beck's "Restoring Honor" rally. December 16, 2009  We keep our hands hovering over the dump button during some interviews. Stephen Colbert puts that power in Snoop Dogg's hands.